My parents gifted Bryan and I with a weekend away for Christmas, all expenses paid, and they kept the boys for us! We didn't intentionally choose Valentine's Day weekend, but it worked out with my work schedule so Bryan and I headed to Kansas City for the weekend! We hadn't been away by ourselves since Mother's Day before I was even pregnant with Rhett, so almost two years. It was much much much needed and we had a great time! This is how I entertained the boys while I got ready and packed! Ha! We left around noon on Friday and dropped the boys off at my parent's house. I also hadn't been away from Rhett for any extended period of time and he is a bit of a momma's boy so we weren't sure how he would do, but he did great! In the car heading to KC! We got to Kansas City around 4 and checked into our hotel and just chilled. We had NO plans and decided to not try and fight the Valentine's Day crowds at any restaurant. We wanted to go to a movie at the Fork and Dine theater but couldn't get into a movie before 9. So we packed up and went to check out Nebraska Furniture Mart. It was really cool and a warm place to kill time before the movie. When we left home on Friday it was 55 degrees and when we got to KC it was 25. YIKES. Crazy that a 3 hour drive can make that much difference. I wasn't very smart when I packed and didn't pack our heavy coats or anything long sleeved for B. Whoops. Outfit of the night, it was cooooold! Then we went to the Fork and Dine movie. Let me just warn you and say DO NOT try to sit on the front row at one of these theaters. We considered it for about .5 seconds and then got our tickets switched to another movie. We ended up seeing Robocop. The movie was okay, but we really just enjoyed the experience. Saturday we hung out around the hotel in the morning and left to do some shopping around noon. It was so nice to be able to read my kindle in peace. I haven't read a book in forever and I almost finished one this weekend. It was sleeting when we left the hotel so we went to Wal-Mart and bought some long sleeved shirts (My husband works in Men's Apparel at WM and so we get the pleasure of checking out stores when we travel anyways...) Then we did a little outlet shopping, got Bryan a suit at Banana Republic and some summer clothes for the boys. 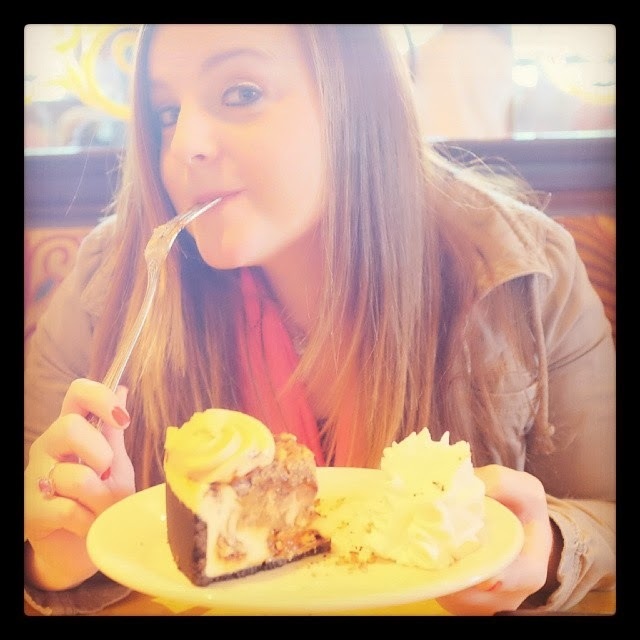 Next stop was lunch at Cheesecake Factory! It is one of our favorites and we don't have one close to us. We ate a very healthy lunch (I love love love the Skinny-licious tacos) and then had some cheesecake! Yum. Then we headed back to our hotel and I took a three hour nap. I mean, what?? It was awesome. Then we got all dressed up and tried to get into Melting Pot at 8 pm and were told there was a 3 hour wait. No, thank you. So we had a late dinner at Hereford House instead. It was yummy. I had to wear Bryan's coat... fashion fail! Love of my whole life, he is so handsome! I had made us reservations at Melting Pot for lunch on Sunday so we did that before we headed home. Melting Pot is my ALL time favorite restaurant. It's our anniversary/special occasion restaurant and is such a fun and romantic experience! Then we put on our sweatpants and headed home, back to the land of 60 degrees. The boys did great for my parents and we were so glad to get them and they were happy to see us! We had a great weekend. Sometimes in the hustle and bustle of life you just forget how important the love is that got you to where you are now. With kids, jobs, groceries, chores... etc... often times our spouses get put on the back burner. This was a great time for us to just get to enjoy each other, not be mom and dad for awhile. We laughed so much and I was reminded all over again why I fell in love with Bryan in the first place. Thanks Mom and Dad (and Gma Jeda too!) for the awesome trip and for taking such good care of the boys! They had a blast too. Best Christmas Gift ever. Awe, what a refreshing and relaxing time. Good for you all! I'll have to remember that next Christmas and give that to our kiddos. Great idea! Happy week!